It can be tough to manage the many expenses that come along with a summer internship. For students with unpaid internships, or internships in high-cost locations, the SuccessWorks Internship Fund provides support payments of up to $5,000. These payments are made possible through the generous donations from UW-Madison family and friends. Preference is given to undergraduate students completing unpaid internships, or those who would not be able to participate in the internship without financial support. Students who are underrepresented in their school, major, and/or industry are also prioritized. 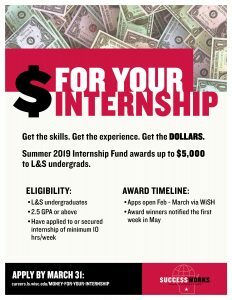 Summer 2019 Internship Fund applications are now open! Application closes March 31. Apply online. If you are unsure of your degree, login to your Student Center and click the My Academics tab, or consult your academic advisor. Have applied to or secured an internship. Must have secured the internship by April 15. How do I know what counts as an internship? Students who receive a financial aid package are encouraged to consult with the Office of Financial Aid to ensure an award will not impact their financial standing. 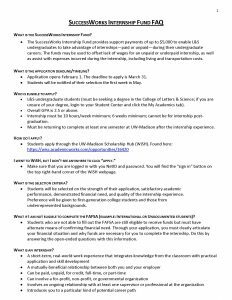 Looking for more financial assistance to support your internship? Start here. The SuccessWorks Internship Fund is made possible by friends and alumni dedicated to changing the lives of L&S students. Make a gift today to help more badgers realize their dreams.